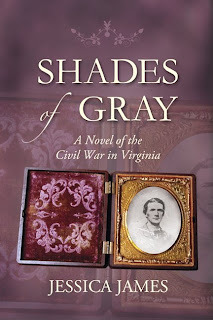 Historical fiction author Jessica James - Civil War fiction Historical Fiction Author Jessica James: Welcome! Hi Jessica...I stumbled arcoss you from a comment you left on another blog. I am glad I did. I have you bookmarked now and will return soon. I have a new and exciting interest in the Civil War and look forward to reading you. Love your book blog, Jessica! I am loving this book, Jessica. I can't put it down! Again, congrats on the great reviews and the awards----I am looking forward to reading the book! As the lineal descendant of nine Confederate soldiers, I have to say that it is fantastic to learn that someone has written a novel that doesn't demonize the South. I love that you are doing something special for Confederate History Month. I have long wished that I had the talent to write an historically correct War Between the States novel. But, alas, I have to content myself with writing Confederate themed "poems." Although I love to read, I don't have the patience to write anything longer. I found you through the SHNV, and I will definitely be checking back!